People keep asking me: "Have you read the Wolfe book?" meaning Donald H. Wolfe's "The Black Dahlia Files: The Mob, the Mogul and the Murder That Transfixed Los Angeles." My answer is always the same: I bought a copy but I haven't read it yet. Still, people keep telling me it's a wonderful job and solves the murder, usually prefaced by the statement that "I don't know anything about the case, but..."
So here we go, in excruciating detail, with frequent detours, asides and references to the five-foot shelf of Black Dahlia books. Since I have to read this turkey, you might as well suffer right along with me. If you’re not interested in Black Dahlia minutiae you will find this a painfully tedious process, which is why I don’t read other Black Dahlia books—they're junk. The dedication: “To Vince Carter... and all the honest cops who took the oath and kept it." 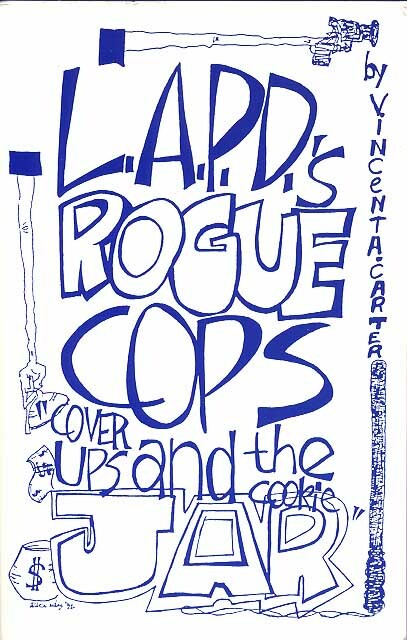 Vincent Carter is, in fact, the author of a 1993 crackpot, self-published book titled "LAPD's Rogue Cops, Cover Ups and the Cookie Jar." At right, the cover (not that one can always judge the quality of a book this way, but the outsider artwork doesn't exactly say: "I'm a definitive source, trust me."). More—much, much more—about “Cookie Jar” later. At least Vincent Carter actually exists, however, unlike the nonexistent Detective Herman Willis who is one of the purported sources in John Gilmore's "Severed." Next page: "It was that name, Black Dahlia, that set this one off..." quoting Detective Harry Hansen. This is from The Times’ often-cited March 28, 1971, article titled "Farewell, My Black Dahlia," by Todd Faulkner. One of the more interesting aspects of this article is that Faulkner mysteriously christened Elizabeth Short with a fictitious middle name, Ann, that is now taken as gospel—even infecting her FBI file, and used rather amusingly as a smoking gun in Steve Hodel’s “Black Dahlia Avenger” to prove his father’s guilt, an "exacta" that shows 1) “Dahlia Avenger” is poorly researched and 2) mercilessly distorted to support its reverse-engineered assumption that Dr. George Hodel committed every unsolved murder in L.A. for several decades. The Faulkner article isn't listed in the book's bibliography, so apparently we're to assume it's from an interview (a neat trick since Hansen died in 1983). But any thorough researcher would recognize the source immediately. More to the point in the 1971 piece, however, is Hansen's emphasis that Elizabeth Short "was a man-crazy tramp but she wasn't a prostitute." This is the sort of thing that a conscientious and dedicated researcher is going to take to heart—and a quick-buck artist is going to sweep under the rug in favor of a shadowy conspiracy involving circles within circles of purported corruption, call girls and mobsters. The Black Dahlia case was often described that way by the late Examiner reporter and foxy grandpa Will Fowler (see the readable but heavily fictionalized “Reporters: Memoirs of a Young Newspaperman,” P. 92). I’ve never heard anybody else ever call it that. “Mogul” certainly doesn’t credit Will for this statement. It’s unsolved all right, but nobody went through the pages pounding them with a rubber stamp. That’s a little ridiculous. In 2002, Los Angeles District Attorney Steve Cooley began establishing an archive of historic twentieth century crime investigations culled from the immense LAPD warehouse and files of the district attorney’s office. Now wait…. This is not just wrong; it’s a serious error. The district attorney is a Los Angeles County jurisdiction while the Los Angeles Police Department is a city agency. 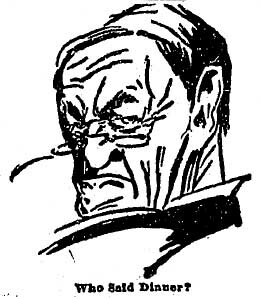 It’s amusing to think of Cooley traipsing into the city archives at the C. Erwin Piper Technical Center on Ramirez and making the staff hand over their material from the LAPD. What actually happened is that the district attorney’s office was cleaning house and shoveled papers that looked important into boxes. The papers aren’t the least bit organized and material from one investigation is mixed up in another. I should know—every Wednesday for a year, I visited the district attorney’s office and read old murder cases, thanks to the very generous people there. In the case of the Black Dahlia material (which I thoroughly inventoried and indexed, and yes, I have a copy of every bit of it except for the body shots—which nobody is allowed to copy) items from several other murder investigations have been erroneously included to rather awkward results. An unlabeled photograph in the Dahlia files is identified in "Mogul" as poor old Maurice Clement—when in fact it’s Salvadore Torres Vara, a suspect in another murder. The only people who would know better are those of us who have seen not only the Dahlia files but other cases. I’m getting way ahead of myself. But it’s disturbing when a purportedly well-researched and well-documented book about a crime tries to sound authoritative while making a gross factual blunder on such an elementary issue. Well, not for the first time. The transcript of the inquest appears in one form or another in several books. But the time line in the district attorney's files is quite pertinent to "Mogul," for it shows conclusively that Elizabeth Short wasn't anywhere near Los Angeles in 1944 or 1945 (despite the lengthy treatment in "Severed" or "Dahlia Avenger." There goes the Georgette Bauerdorf/Hollywood Canteen connection) . Another inconvenient little detail swept under the rug because only the people who have seen the files know better. The files also reveal the Herculean effort by the upper echelons of the Los Angeles Police Department to cover up the nature of the crime. In a word: No. There's nothing about any sort of cover-up in the district attorney's files. In fact, the files reveal just the opposite--no sign of anything other than a harried and harassed Police Department victimized by the overzealous police psychiatrist, Dr. Joseph Paul DeRiver, who sincerely but erroneously believed he had solved the case by accusing Leslie Dillon. DeRiver's actions prompted the 1949 Los Angeles County Grand Jury to investigate the case, the reason for the district attorney's files on Elizabeth Short. The Dillon matter constitutes the vast majority of the district attorney's files. The next paragraph is quite handily done. Wolfe quickly dispenses with "Dahlia Avenger," Mary Pacios' "Childhood Shadows," Janice Knowlton's "Daddy Was the Black Dahlia Killer" and makes peace with "Severed," paving the way for inclusion of John Gilmore's book, which is 25% mistakes and 50% fiction, as we'll see later. Ah, no. Even I fell for that one. Will was one of the last ones there. His story about arriving at the crime scene with Felix Paegel, getting his picture taken with the body (he always claimed the photo had "vanished"), rushing to the Examiner to put out an extra, and returning to the crime scene to "fool the competition" is utterly false. No copy of the supposed extra has ever surfaced and photos of the crime scene completely disprove his claims of being the first reporter at the crime scene. Thank you, you're doing an important service warning others of Wolfe's ridiculous solution to the so-called Black Dahlia case. To go to those lengths to unload an unwanted pregnant girlfriend is nonsense---she could've been payed-off! His solution is totally unbelievable.